The FM01 resilient floor mount is a structural connection that reduces impact vibration passing through floors. It is particularly suitable for the discontinuous construction and separating floors in apartments, villas & duplexes and any specialised room that requires high vibration isolation such as multi-story constructions. 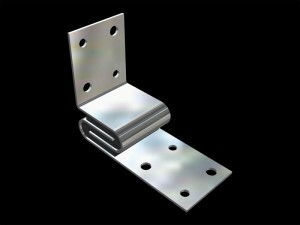 Matrix Industries FM01 floor mounts comply with Australian Standards. FM01 resilient floor mounts were assessed in field tests comparing identical isolated and non-isolated rooms within the same building. The acoustic consultant’s report stated, “The vibration isolation incorporated into the building is working satisfactorily, reducing vibration and structure borne noise between the rooms. This is achieved using Poron 4701 cellular urethane foam. Where a floor in a building is required to have an impact sound insulation rating under the requirements of the Building Code of Australia (BCA) Matrix floor mounts will satisfy these requirments. 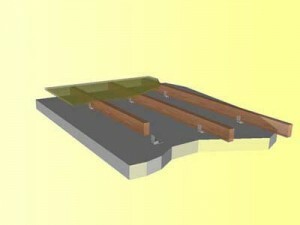 All ties are manufactured with two 4.5mm and 6.3 mm holes on each face. 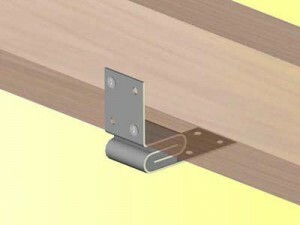 This allows the tie to be screwed to timber using self tapping screws and into concrete using concrete anchors. 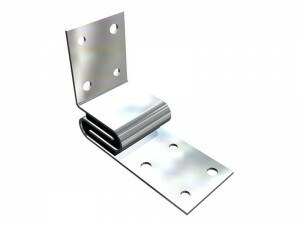 Matrix recommends the use of Ramset Light duty masonry anchor, SHURDRIVE tm and No. 12 Type 17 screw or equivalent.